Mana Pools National Park Zimbabwe. The Best way to spend your time at Mana Pools is to take a picnic lunch and park at one of the pools, especially Chine pool or Long pool, and relax while all manner of creatures come to drink. You could take a walk to explore the vegetation, and see if you can develop an understanding of some of the myriad relationships among the animals and plants. A walk along the river bank from Nyamepi camp to Nu Kupe camp and the Mbera River is highly recommended, but do not stray into tall grass or bush, and keep a sharp eye out for buffalo in this area. A walk along Chine Pool, or from Chine Pool to Nu Kupe if your bush navigation is good, takes you among the tall and shady apple-ring acacias. You should watch out for lion in this area, but the bush is quite open and relatively save. Walking along Long Pool is also beautiful, but a bit more risky, since there is a lot of thick bush. 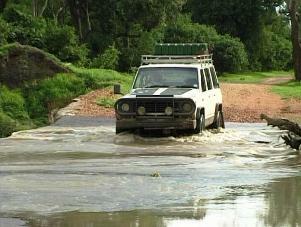 Nyamepi Camp is 4 ha in extent and has a total of 29 camping sites. 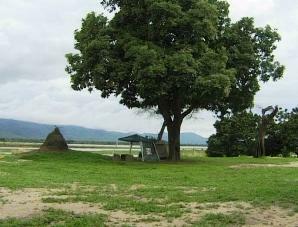 The camp is set on the banks of the Zambezi River and campers can enjoy a magnificent view of the Lower Zambezi National Park and the mountains across the river into Zambia. Shady campsites are set well apart that will leave you with a feeling of solitude even when the camp is full. Firewood is provided in limited quantities at the entrance to the camp and must be purchased. Collecting of firewood from the veld is prohibited and visitors are urged to take their own gas stoves. The camp has 4 ablution blocks with hot and cold showers, bath and flushing toilets. 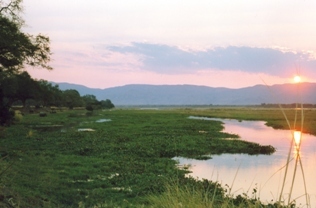 There is no place better equipped to put you in touch with your primal nature than Mana Pools. Here you will experience the true African wilderness, with no protective fences, no guides, and no defences. If this thought frightens you, Mana pools is not for you. If it excites you, you will have the holiday of a lifetime. The best way to spend your time at Mana Pools is to enjoy being alive and a part of the natural environment. You can do this by simply sitting on the bank of the Zambezi, and watching nature happen around you. As the camp is not fenced you could be surprised by occasional visits from buffalo, elephant and even lion. Be aware, even if they seem to be tame, all animals are unpredictable and can be very dangerous. Watch out for baboons and monkeys whose only mission seems to be raiding your campsites during the day. During the night be on the alert for scavengers like hyena. Don't leave any food or cooking utensils outside. Lock it up in your vehicle. Hippo might wander into the camp at night and surprise you. It could be an unpleasant and tragic surprise as it is claimed to be the most dangerous animal in Africa. Fishing is permitted but there is a limit of 6 fish per day. The Zambezi is renowned for its tiger fish and Mana Pools is the ideal place to catch this monster of the deep. While fishing you must constantly be aware of the presence of hippo and crocodile. There are 2 large lodges situated a short distance upstream from Nyamepi camp each designed to accommodate up to 8 persons. The lodges are self-contained and fully equipped with furniture, all bedding, towels, cooking utensils, cutlery and crockery. Cooking is by gas stove and there is a gas fridge/freezer in each lodge. Visitors should make sure all doors are locked when they are not in the lodge to prevent access by baboons and monkeys. Sitting on the veranda you can admire the unspoiled beauty of the river as it winds its way through the valley.